In a joint operation with the carrier HMS Eagle, Dunedin was dispatched on 29th May 1941 to search for an enemy supply ship (not known at the time to be the Lothringen), reported as being somewhere in the region of 25 degrees North, 34 degrees West. After extensive searching, Eagle’s Swordfish aircraft spotted the tanker on 15th June and Dunedin, with one boiler out of action, made best speed to the scene. Dunedin found Lothringen damaged (from attacks by the Swordfish, including Jim Suthers) but still afloat as the Merchant Navy crewmembers had refused to scuttle her. 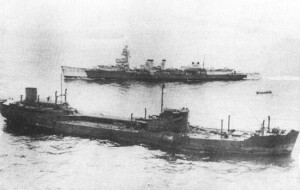 When Eagle arrived later in the evening, Dunedin had the situation well in hand and the Lothringen was ready to be steamed to Bermuda. This was an important capture. Not only did it deny the Germans vital oil supplies for their U-boats, but also important Enigma material was found where it had fallen behind a filing cabinet in the wireless room. My involvement with the Lothringen begins as described on page of 103 Blood in the Sea,” three other Swordfish from Eagle joined him (Camidge) around 3 pm”. We circled the German ship, continuously emptying a drum of 303 ammunition, courtesy of our rear gunners, on her whenever there were signs of movement on her decks. My observer, not my regular one, suddenly asked me over the inter-com whether I would carry out a low run over Lothringen, as he had something he wished to drop on her. I wasn’t keen (an understatement !! ), and I asked him what was he planning on dropping. He replied that he had a lidded tin into which he had urinated and wanted to get back at the Germans following the bombing of his parent’s house. Very reluctantly I agreed and having informed our air gunner also unenthusiastic, I flew very low over the Lothringen at mast level and the object was lobbed over the side of my Swordfish the lid not detaching I am glad to say. No attempt was made by German crew members to fire at us, although we must have been sitting targets. By now Dunedin’s boarding party’s boat was coming alongside Lothringen and we had the frustrating view of seeing confidential books being thrown into the sea. There was nothing we could do about this without risking hitting the Dunedin’s boarding party. All of us in Eagle were impressed with the accurate intelligence information provided by the Admiralty not of course knowing anything about Bletchley Park at that time. 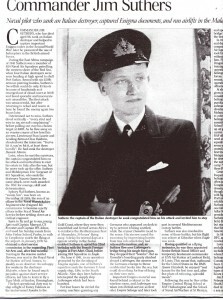 Here is an extract from Jim’s obituary, published in the Daily Telegraph on 27 March 2007. Click the image to enlarge.